It was Saturday morning and I was warm and cozy in bed. I wasn’t ready to face the cold morning yet. I started watching an Extreme Makeover show from 2005. It caught my attention. The couple receiving the make over were the Teas who run Camp Barnabas nestled in the Ozarks in southwestern Missouri. The camp volunteers submitted their names as worthy of a make-over because their house was in dire need of repair. That of course is the theme of every extreme make-over but this one was different. The Teas couple have been running Camp Barnabas for seventeen years. He studied to be an underwater archeologist and she was a pediatric nurse. They felt called to service. When they started the camp, their own children were still in elementary school. Now they are mature adults. When they came home from college, they often slept on the couches in the living room because visiting volunteers were given their rooms to sleep. The reason that the Teas’ home was in disrepair was due to their not taking any more money out of the camp than that which was absolutely needed. They weighed every repair over the cost of a scholarship for another child. Thus, there was much personal neglect of their own needs. Their son summed up their attitude. As long as they had a roof over their heads, they were satisfied. At that point I got a call. The TV which was to be delivered between 8 and 12 was ten minutes away. It was only 7:15. I had to stop watching. Due to a couple of minor problems, I did not get back to the program until the very end. It seems instead of one house for the owners of the camp, they were gifted with three buildings. Their home, a bunk house for visiting volunteers, and a rainy day activity building for the campers complete with all types of diversions and games. I became interested in this camp and wanted to know more about it. Camp Barnabas was named after Joseph, surnamed Barnabas, who was made a saint. He was a doctor as well as an apostle associated with Paul and was known for his kind heart. From the little I heard about the Teas family, that describes them as well. The Teas’ camp is for children with special needs. They try to accomodate to the best of their ability as many children as they can. This is their next summer’s schedule. Siblings are invited to all terms EXCEPT Terms 1, 5 and 9. Term 1: Adult Friends Tuesday, June 1st – Monday, June 7th Developmentally Disabled (Ages 18-45) Returning campers older than 45 may enroll. This is from their website. We strive to meet the needs of every person that applies to be a camper. Your eligibility starts with being age appropriate: our youngest campers are age 7. Other requirements include having a challenge or disease that fits into our program safely and appropriately. As you can see, their camping services extend beyond the age of 17. Some campers continue to return after they are 45 and are still welcomed. You also notice that there is no lapse in there summer schedule. There is no down time. There is only one day between one group leaving and another group arriving. They don’t take the week end off. I found this to be very impressive. The schedule is as packed as possible to serve the needs of as many children as possible. In contrast to this story, a week before when I was driving to church, I was listening to a PBS interview featuring an IRS agent. The topic was the proliferation of “charities” within the past decade. The people with “charitable hearts” asking for donations to “serve others” are coming out of the woodwork in droves….kind of like cockroaches. (My words…not the IRS agent’s) He mentioned two organizations who have been operating, although he didn’t specifically tell the names. One is a breast cancer group who manages to have $0.13 left after administrative costs. The other was a veterans’ group that out of every dollar collected, have $0.01 left for the veterans. The IRS is starting to watch groups like these more closely. They want to have their records more open for potential donors to see where their money is going. When I started researching for today’s blog, I ran across some very interesting information. I’m sure you have seen the commercials on TV millions of time about the children in third world countries. Maria has never worn any shoes as she walks though the garbage heaps looking for metals to recycle. Jose greets everybody he can while looking for scraps of food. Twelve year old Mohammad often doesn’t eat because he shares his food with his three little siblings. He is the only one caring for them. These commercials are deliberately designed to tug at heart-strings. What the public doesn’t know is that the CEO’s of these charities are tugging at the purse strings at the same time. 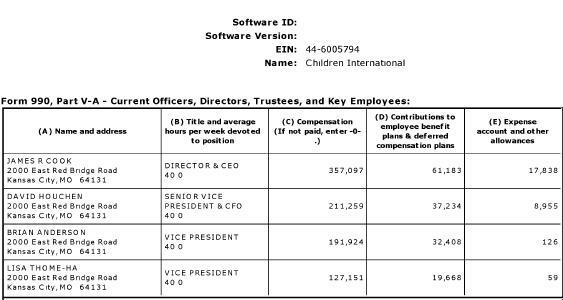 These are the 2008 salaries of the top four execs of Children’s International. That is just one sample. If you wish more information about a charity you may support, you can begin here where you can find the IRS 990 forms of many organizations. Then there is the salary of this CEO. He is third on the list of the top ten executive compensation packages for non-profit organizations. The median pay for top non-profit executives rose 7% in 2008 to $418,555, a fraction of the $7.6 million in median pay for S&P 500 CEOs in 2008, a USA TODAY analysis found. Did your income rise 7% in 2008? The justification I keep hearing over and over is “We pay that much to keep the talent. They’d just go elsewhere if we didn’t.” I’m sorry. The income for these establishments are coming from people who expect to help as many CHILDREN as possible. If the CEOs of charities are so talented, LET them go to for-profit organizations. The salary of Cook, receiving close to $ 0.5 million pales in comparison to Altshuler’s $2.3 million annual salary. There are too many examples of what I consider ultimate greed to cite. How did it get so out of control? How many other people are like the Teas in comparison to those who are like Altshuler? The Better Business Bureau allows non-profits to have membership if their administrative costs are held to 35 – 50% of monies donated. That in itself is rather generous when you are talking sometimes billions of dollars.